Photo of an American soldier in the Spanish American war. 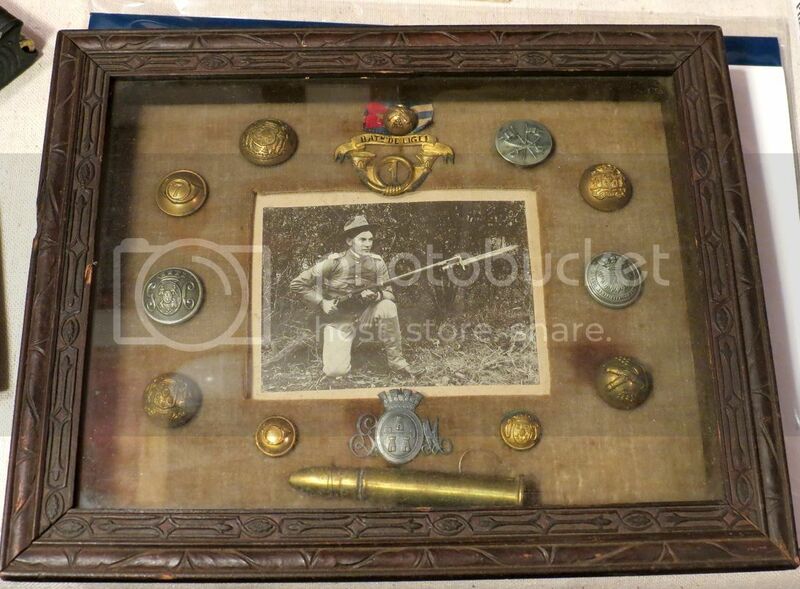 Framed in a shadow box with Spanish uniform buttons and insignias. 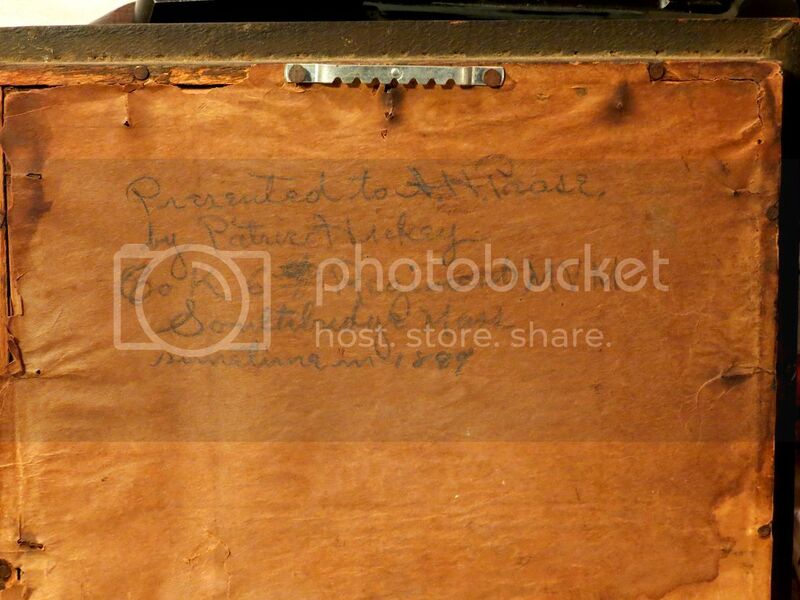 Soldier's name and unit is scrawled in the back and a note that it was presented in 1898. The original chain hanger seem to have been replaced with a contemporary frame hanger. It probably broke. 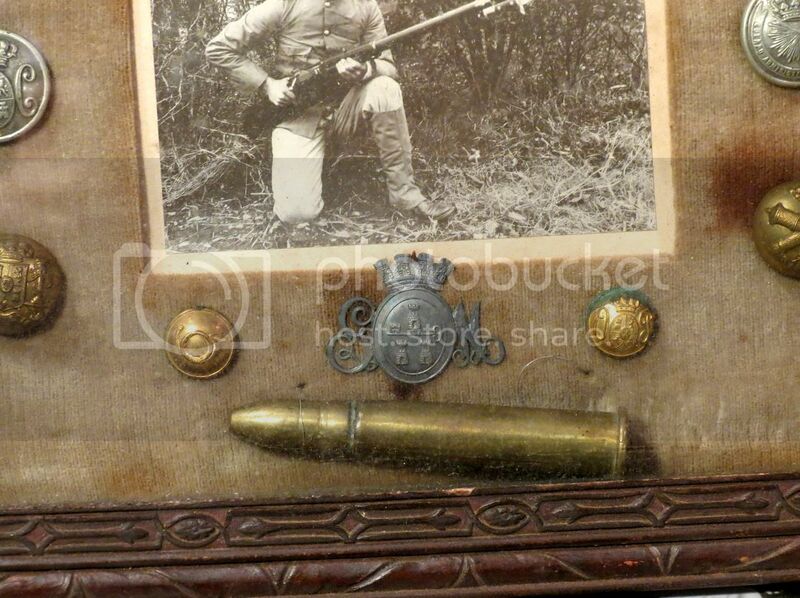 The round displayed with the photo is a Spanish .43 Remington. Thanks for the photo of this very nice collection of Spanish souvenir relics. The items are all form Cuba. This is interesting as the the presentation on the back says that it was the property of a soldier in the 6th Massachusetts Infantry. This unit fought in Puerto Rico, not Cuba. 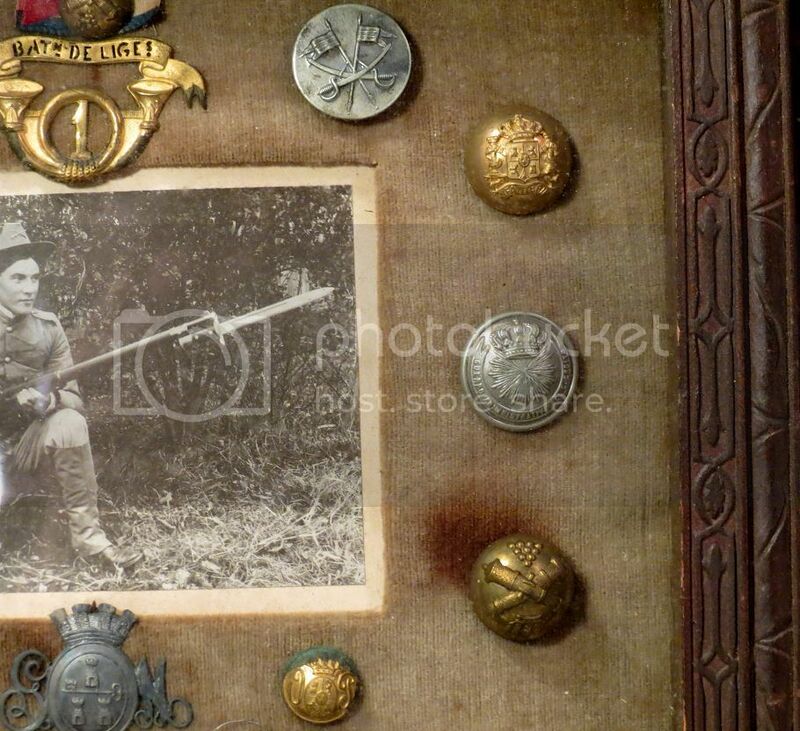 The central photo is of an American soldier, probably the original owner named on the back. 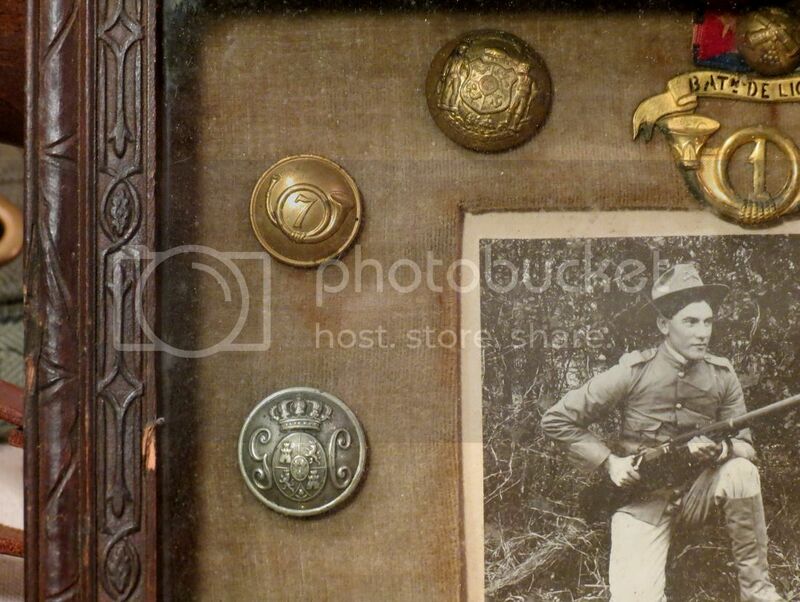 The buttons and insignia along the top are (from left to right) a US Wisconsin state seal button, a small Spanish artillery button on a small cloth Cuban flag, a Spanish collar insignia for the 1st Light (Ligeros) Battalion of Havana, a volunteer unit. There were two battalions of "Ligeros" in Cuba, both with similar insignia but different unit numbers. 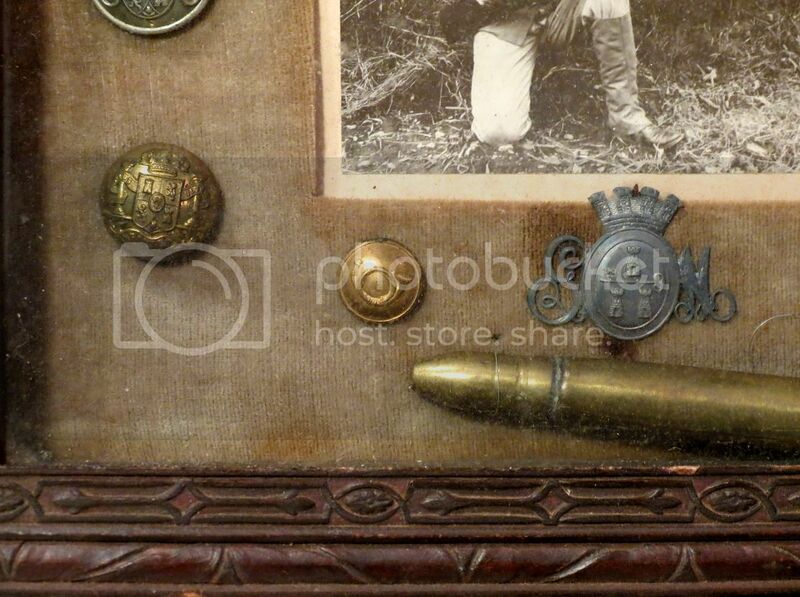 These should not be confused with the Cazadores (Light Infantry) battalions of which there were 7 in the Havana volunteer organization, and a Spanish Model 1892 cavalry button. 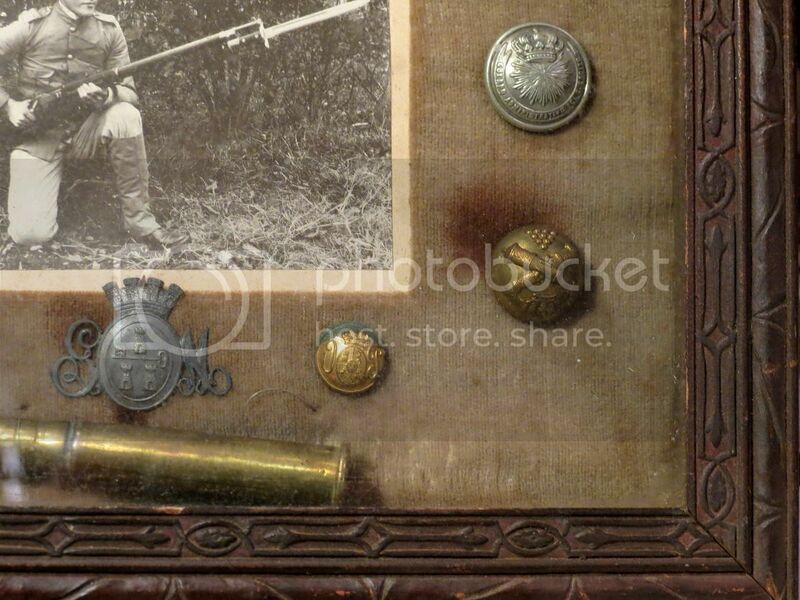 Down the left side are (top to bottom) a Spanish 7th Volunteer Cazadores button, a Guardia Civil button. 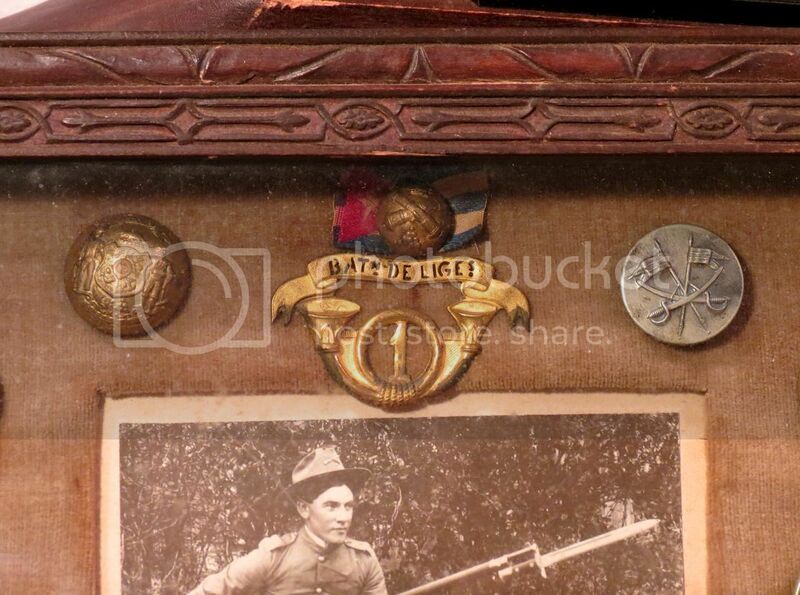 The Civil Guard served both as a police force and military unit, and the Spanish army regular infantry button used by both regular Line regiments and Cazadores battalions. Down the right side are another infantry button, a Spanish Corps of Military Administration (Quartermaster Corps) button, and a Spanish artillery button shown upside down. Along the bottom are a cuff size volunteer Cazadores button without unit designation for a small independent unit in a small town, The cap or collar insignia of the Spanish Havana Guardia Municipal, the city police force, and a cuff size Orden Publico button. The OP was a paramilitary police regiment in Havana. The cartridge at the bottom is a .43 cal. Spanish Reformado cartridge. This was an improved round made for the Spanish made copies of the Remington rolling block rifles. This cartridge was made famous in American propaganda of the period as the "Poison Bullet" as the brass jacket on the projectile would oxidize green under tropical conditions.